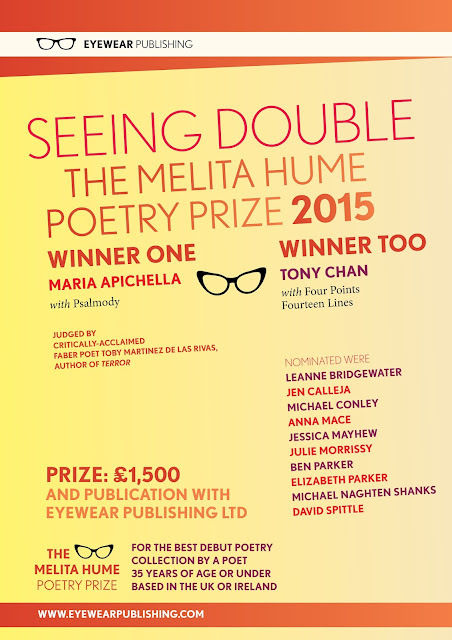 THE WINNER OF THE MELITA HUME POETRY PRIZE 2015 IS A TIE: MARIA APICHELLA AND TONY CHAN! BOTH WINNING COLLECTIONS MERGE TRADITIONAL FORMS (PSALMS, OR SONNETS) WITH STRIKINGLY CONTEMPORARY CONCERNS, AND CREATIVE PASSION. 'It has been a pleasure – a difficult pleasure, but a pleasure nonetheless – to have judged this year’s entries for the Melita Hume Poetry Prize which is beginning to make itself an increasingly important part of the annual literary calendar for poets who are yet to publish a first book. Before I proceed to talk briefly about the some of the entries which so impressed me this year, as well as the winners, I think it very important that we take a moment to acknowledge that: that without the generous advocacy of publishers such as Eyewear, its director Dr Todd Swift, and this prize in particular, the literary landscape we all share would be a significantly poorer one. The Melita Hume Prize has helped give exposure to some excellent poets since its inception, and that tradition is very much carried on this year. Over the last few weeks, I have read a great range of different voices – some wilfully avant garde in their play with language as a material in itself, some more focussed on what I guess might be called the traditional themes of poetry. Whatever the background or predilections of the particular poets, I can honestly say that I found much to enjoy in each collection, from Ben Parker’s wry, controlled, surreal and formally adventurous collection Insomnia Postcards to Anna Mace’s innovative, verbally lush submission am. I was also very pleased to see some excellent collections come in from Ireland – particularly Julie Morrissy’s The Foehn Wind with its concise, clean power. I remarked to Todd that, had I also had the remit to produce an anthology of the short-listed writers, I know I could have produced a fascinating artefact. So why have I not chosen the winners from among these, and other, excellent submissions? Well, part of my remit was to find a full collection – a collection which was more or less complete and ready to go, and, while I was very taken with many individual poems and even whole sections of each short-listed writer, I do feel that they were, in many ways, half-collections or three-quarter collections. These poets’ time will come, but in each of their cases, I would advocate a little more work on the collection as a whole. Getting a book ready is a punishing and difficult task, and it requires patience and a kind of courage to overcome setbacks, and I would very much like to encourage all of the shortlisted writers to have faith in the value of their work, which was very plain to me, and to keep refining these collections. There were, however, two collections which did seem to me ready, now. The first of these that I read was Maria Apichella’s beautiful, unsparing study of love and faith, Psalmody. The collection is broadly about the writer’s developing relationship with a soldier, David, due to be posted to the Middle East, and the conflict this engenders with the poet’s deeply held, but also deeply afflicted, religious faith. As the collection develops, its central character becomes inextricably identified with the Old Testament King and Psalmist, and the poet’s response is a series of 80 free verse – though deeply rhythmical – psalms which transplant all of that form’s tropes – vivid eroticism, praise, questioning, triumph, doubt, a lush naturalism – into modern Wales. Above and beyond the technical skill on display in each poem, what I most admired in this collection was its searingly intelligent intimacy, a deeply constructed symbolism which constantly re-surfaces throughout the book and a powerful, direct, unsettling and, at times, very beautiful and stark lyric. The second collection for which I held deep admiration was Tony Chan’s Four Points Fourteen Lines which, like Maria’s Psalmody had its own remarkable back-story. In January this year, Tony left his job, and embarked on a 78 day, 1400 mile trek across Britain, incorporating its northern, southern, western and eastern extremities. That in itself is an extraordinary undertaking, but Tony also produced a sonnet at the end of each day – these sonnets constituted the collection, each one unedited and presented entirely as it emerged on the day in question. So, like Maria, Tony has reached into the past and brought us a new way of seeing an old, familiar form, and he has done it with equal skill. Looking back over my notes as I was reading the collection, I find the following: ‘Supremely generous,’ ‘At times, technically brilliant,’ ‘A clever mix of overblown Romantic structures with a self-deprecating tone which is very attractive’. It is undoubtedly not perfect – he often writes in full rhyme, and iambic pentameter, fantastically difficult to control even with forensic editing – but that slight unevenness is all part of the fun, part of the hugely generous vision, the willingness to push on, which makes this collection ultimately so rewarding and enjoyable.